Christmas is a time of joy, community and goodwill. It is a time of giving and helping those who are less fortunate than us. 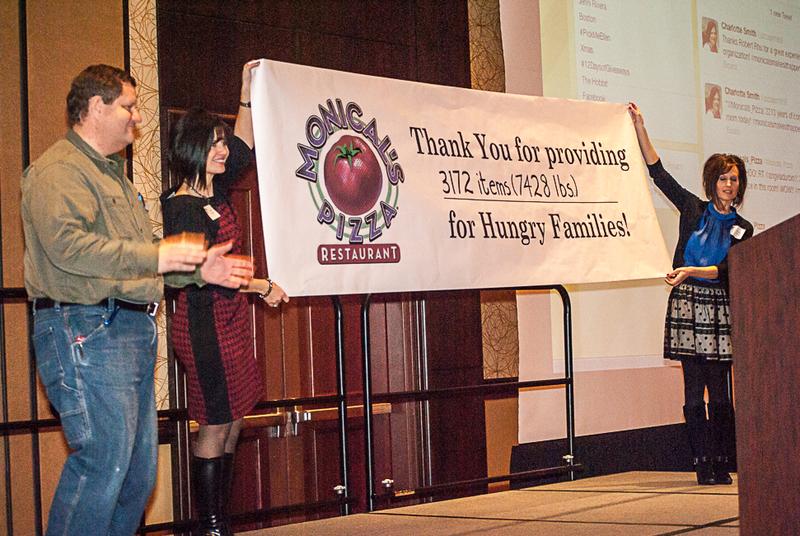 This year, Monical’s Pizza made it happen during its annual holiday meeting on Monday, December 10th in Bloomington, IL. During the Holiday Meeting, attendees donated non-perishable food items, which prior to being given to the Midwest Food Bank, were used to create a (temporary) indoor miniature golf course. This went to prove that sometimes it’s ok to play with your food. When finished, it was determined that 3,172 items (or 7,428 pounds) of food plus and additional $415 were donated to the Midwest Food Bank, which supplies over half of the food banks in Illinois. In lieu of having a gift exchange, Monical’s managers, corporate support staff, franchise owners and vendors attending their Holiday Meeting were asked to bring an unwrapped toy donation for Toys for Tots. The Monical’s Team in attendance helped Central Illinois residents by donating nearly two vans full of gifts at this event. Monical’s Pizza restaurants are also collection sites, where guests and restaurant staff can also make toy donations. The McLean County Toys for Tots is celebraring it’s 20th Anniversary this year. Matt Drat accepted Monical’s toy donations on behalf of the organization. Their goal for the county this year is 20,000 toys for more than 6000 children. Monical’s Pizza would like to thank Central Illinois Produce, Vermilion Valley Produce, Fontanini, Randolph Packing, Busey Bank, Enterprise Rent-A-Car and Grand Victoria Casino for helping make their Holiday Meeting a success! A special “Thank You” goes to Delco Foods, Gordon Food Service and Pepsi for donating food which will go to the Midwest Food Bank and for contributing to the success of this annual event!